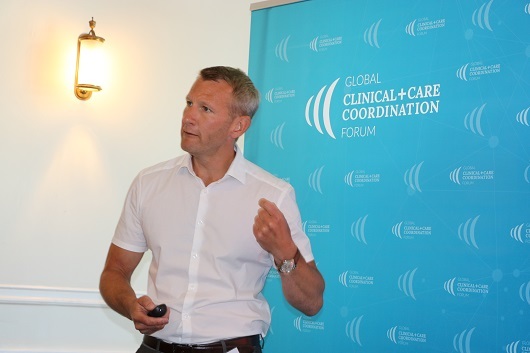 The Global Clinical + Care Coordination Forum (GCCCF) has been organizing a series of events in major European cities. The aim is to provide leaders in healthcare with an update on management strategies and technologies for the optimization of care, and to foster the top-level exchange of opinions. 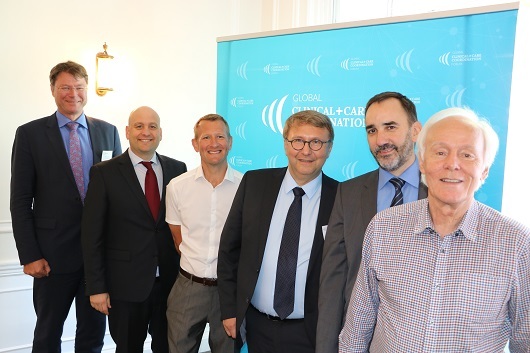 The GCCCF Roundtable edition mid-May in London set its focus on the adoption and diffusion of digital technology at the point of care. 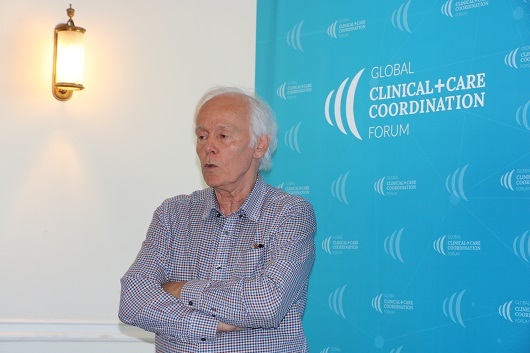 “All of the stakeholders in the sector are heroes”, underlined Ljubisav Matejevic, President of the GCCCF, in his welcome address to representatives from care provider and payor organizations, professional bodies, policymaking, and the industry. “In order to enable physicians, nurses, and admin staff to achieve optimal outcomes for patients who rely on their commitment, organizations require the best methods and tools for communication, coordination, and collaboration”, continued Matejevic. This becomes even more challenging when demography leads to enormously increasing demand for care. Except for utilizing digitization technology, many other factors need to be considered in the development of strategies. “The incidence of sepsis is huge”, is how Dr. Ron Daniels BEM outlined the relevance of this condition. The condition causes approximately 44,000 deaths and 150,000 hospital admissions in the UK each year. Proper management methods are key in improving this situation, the CEO of the UK Sepsis Trust and Global Sepsis Alliance, and Clinical Adviser to WHO continued to explain. In his presentation, Dr. Daniels gave the example of the disquieting sepsis journey of a young girl. “The Sequential (Sepsis-related) Organ Failure Assessment (SOFA) captures at best about 40 percent of cases”, according to the expert. Management of sepsis can be significantly improved by the “Sepsis Six Care Bundle” (S6CB), a coordinated care pathway which results in reduced mortality for unscheduled as well as ward inpatients. Regarding antibiotics frontloading, the key message is “administer not more but earlier”. Biomarkers may come into broader use for early detection. “Obstructions have been huge – but today, Genomics is here”, claimed Prof. David Patterson. The challenge is now to productively balance clinical and personalized medicine with ‘Big Data’ in order to gain the full benefits of genomic and proteomic information for the patient, the Emeritus Professor of Cardiovascular Medicine, University College London, continued. 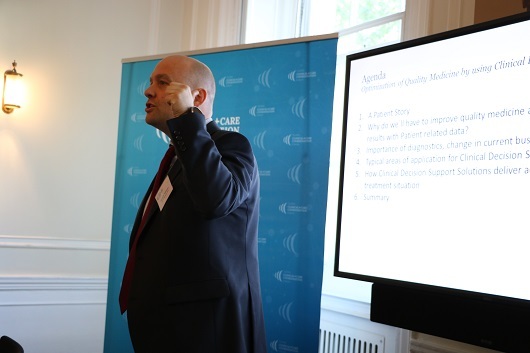 He was, however, candid about the situation of physicians in the NHS: the demand for service is exploding, ways to access care are inefficient, and stakeholder relationships are falling apart due to the crisis situation following the activities of the Clinical Commissioning Groups. Prof. Patterson’s suggestion for making innovative methods available to patients is, “Breaking away from the public system and establishing a company to gain freedom”. He founded Helicon, a company that provides feasible solutions. It enhances the engagement of carers and patients, and it propels forward the journey towards increased self-management by giving patients support and education through portal solutions and apps. “Electronic Medical Records (EMRs) provide the central platform for patient-related communication, for efficient processes, and the dissemination of medical knowledge” – this is their key role, said Dr. Michael von Wagner, Consultant for Internal Medicine and Senior Physician in the Department for Gastroenterology at the University Hospital Frankfurt. His organization has achieved an Electronic Medical Record Adoption (EMRAM, by HIMSS www.himss.org) score of 5.21. In general, the hospital has a track record of successful digitization measures which include the introduction of clinical decision support in 2015. Recently, the provider implemented patient management into their EMR to optimize coordination of stakeholders in treatment processes. 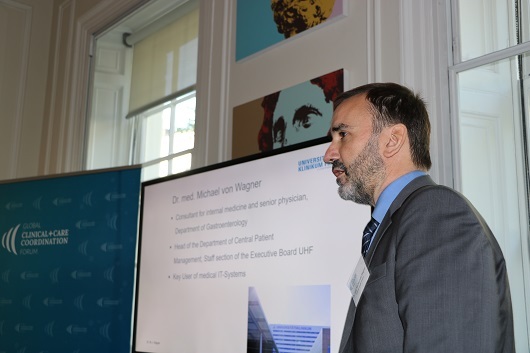 Dr. von Wagner, who heads the Board of Key Users, described the benefits of patient management – including scheduling for treatment steps where various health workers are involved – in particular for complex interventions and therapies. Overall, according to the expert, process management and digitization have resulted in a 54 percent increase of patients, a 40 percent acceleration of invoice processing, and a 26 percent cut in length of stay. “Put the patient into center of the coordination”, urged Dr. von Wagner. “Quality medicine can be optimized by use of clinical decision support systems”, claimed Alexander Hoffmann. Patient situations may be highly complex with a multitude of contributing factors. Those factors need to be taken into account in order to improve the patient’s status, urged the Senior Manager Integrated Clinical Care Solutions EMEA, Abbott Diagnostics … with most decisions driven by diagnostic information that comes from laboratories. Hoffmann took a patient’s need as an example and suggested to think from the patient’s perspective and create patient pathways. In his example, Maria is a patient who requires coordinated support to improve her health status in a complex care situation. Maria’s case illustrates that laboratory medicine is emerging as a hidden treasure, according to the expert. Lab test interpretations help making clinical decisions more precise, resulting in improved outcomes and reduced costs. “In care, let’s strive to understand how things can be done better, with technology serving as an enabler. We need to agree on our common aims and take small steps. In alliance, we can do more”, summarized Matejevic. GCCCF brings people together for a joint start of this cumbersome journey.